Wow what a roller coaster of a week; started going down, then went up, went down again and then finished with a wonderful weekend in Latgale region. The week started off on Monday with us going to immigration to register. Unfortunately we couldn’t, because my contract at school only lasted to the end of the school year. I will be getting a new contract for next year but haven’t got it yet. We then went to a bank to try and open a bank account but yet again ran into a stone wall because of the limited length of the school contract. The day ended fantastically when we agreed to buy a house in Limbazi. We had seen this house on the internet, many months ago, whilst in the UK. It seemed to have all the features we were looking for and had a similar feel top our flat in Isleworth, which we loved so much. So it was with much relief that we were able to agree a price with the vendors. They are a really nice young couple, she is an artist and he is a sales and marketing director with a Latvian company who manufacture wooden pre built houses which are assembled on site. We met for lunch on Wed to try and agree contract details. Selling a house in Latvia is much simpler than in the UK but much more costly as you have to pay income tax on any profit you make on the sale of your home. So you have to try a come to an agreement with the vendors as to how much you pay for the house and how much you pay for fixtures and fittings and equipment. Secondly it doesn’t seem to matter whether a contract for purchase or contract for sale is written as long as both parties agree to it. A friend of Inta’s is writing the contract so we are just waiting for the terms the vendors want including. I hope the sale can be concluded before the end of July. I will keep you updated. So we agreed the purchase and we were on an up. Tuesday started well when I received a call from the bursar saying a new contract to July 2015 was ready for me to collect. I would now be able to register with immigration. We were also recommended a bank who might open a bank account for me. Latvian banks seen obsessed about money laundering and I had to prove where my money was coming from. So off we went, not sure what Inta and Oksana (the person we met at the bank) were talking about, I was a silent partner for most of the time, but I filled in a load of forms in English, Inta filled them again in Latvian and they were sent off to head office for a decision to be made. We got a phone call the following day saying they had agreed to open an account for me. Yippee things were finally moving forward. I could get pain from work now and transfer my euros from the UK which are sat in an offshore account somewhere. Off to the bank again, signed all the forms, got my account number and found out I could have a special account because I am 60. Fantastic. The problem is there is always a but. I was told that I can transfer my funds from the UK, but I can’t withdraw them until I can prove where they came from. So I can’t buy the house or a new car until I can prove the source. I gave them emails and completion statement from my solicitor and a bank statement printed from the internet. We are waiting for an answer. If this isn’t enough I will have to wait until the original documents come in the post. Nightmare!!!! After last Friday, at school, the school director sent an email to all staff with a photo, telling them what a fantastic job I had done fixing all the Samsung netbooks for them. I wish she had never sent it because this Friday I had a really unproductive day. Started trying to fix a couple of Samsung Laptops which kept freezing. Spent hours trying to solve the puzzle and backup unsaved data, but to no avail. Decided I would have to reimage the machines, but there were no images and no original disks. So downloaded an ISO image from the Microsoft website, but couldn’t get it to run. Bad day at work, name will be mud now. I write this blog looking out over a beautifully ploughed vegetable patch, listening to the birds sing and the bees buzzing around me, in one of my favourite places on the planet, in a place the vast majority of people, thankfully, have never heard of or visit. We are staying at Intas’ god parents farm which is about 30 km from the border with Belorussia. Since the end of the Soviet era and centralised agricultural planning, the forests and wildlife have flourished. Wild boar are in abundance, as are elk, beaver and deer. In this particular area possums also thrive. The diversity of different trees in the forests are a wonder to behold as are the meadows of wild flowers which have an amazing number of medicinal and culinary uses. Even the trees have medicinal uses. Yesterday we went picking the new buds from a certain type of pine tree. Tomorrow, we will put them in a bottle, until half full and then pour vodka over them. I can hear the cynics out there saying that this is just another way of drinking vodka. No you are wrong. It should be used in winter when you can feel the start of a sore throat or cough. Apparently it tastes disgusting and you have to drink it slowly so it covers the throat properly. I’ll let you know if it works in the winter. There is still a bartering type of economy here. 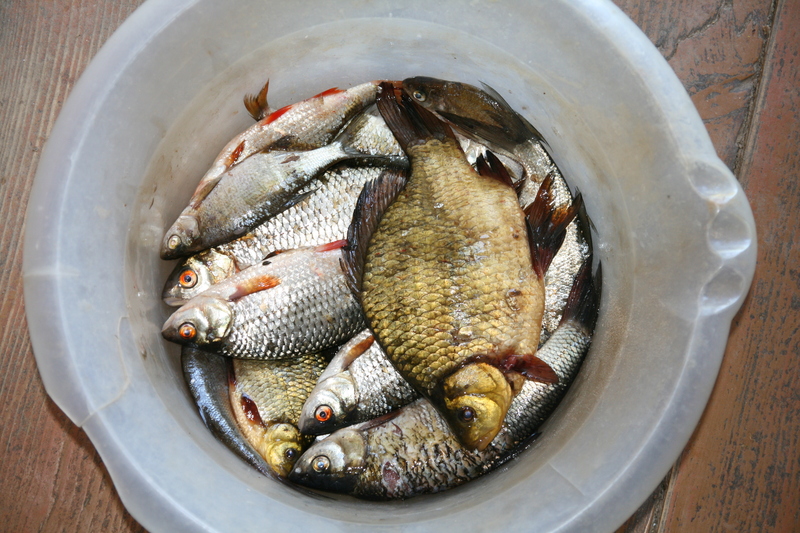 Yesterday and today a local fisherman called round with some fish he had just caught in the nearby lake. I knew they were fresh because they were looking at me gasping for air and asking me to save them. What they didn’t know is that I love fresh pan fried fish. I don’t know the weight of them but krustmate (godmother) paid him 10 Marlborough cigarettes and some honey, from her bee hives, for the lot. Seems a bargain to me. Had a sauna last night, missed the whipping with birch branches because Inta forgot to collect them from the forest. Not too upset about that. We spent Saturday planting potatoes and seeds of many other vegetables. I’ve found muscles I didn’t know I had and gained some new knowledge when we eventually buy our own house in the country. The only drawback for me is that the Latvia insect life seems to like my blood. Itching all over my arms at the moment. Sadly we’ll be leaving in a couple of hours, car loaded with organic honey, potatoes, carrots and bags full with leaves and flowers to make herbal teas. Life here is obviously a very healthy one. Krustmate and her husband Alexandre are both in their eighties and have more energy and stamina then many half their age or younger. He continues to drive his tractors, cut down trees and chop up the logs ready for winter, whilst she keeps the home, and plants all the food they will grow over the spring and summer. They are just wonderful people and even though I don’t understand a word they say we do manage to communicate. Got a 5 hour journey ahead of me now back to Riga. It’s not too far but with poor roads and a speed limit of 90 kph (60 mph) it takes a while. I’m doing my first day as a substitute teacher tomorrow, I’ll let you know how it goes next week. This entry was posted in Latvia and tagged latgale, Latvia, nature. Bookmark the permalink. Seems like you’re having a ball !!! Cant wait to visit ! Oh I’m jealous! Sounds great. I have lost my voice so could do with some of that vodka stuff today. Glad to hear things are going well. Such a positive and homely feeling takes me over after reading your blog. Wishing you all the best in Latvia. Thank you, I’m pleased you enjoy reading it.